Wow! I can’t believe it’s Monday already. I feel like I just posted my menu plan from last week. I thought the rule was that hot summer days went by very slowly, but my days are just flying by! Do you feel like that? Are your days flying by or are you dragging waiting for the heat to dissipate and school to start? 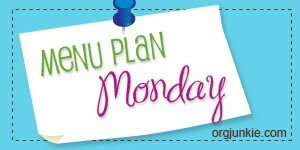 For more great recipes and menu plan ideas, visit I’m An Organizing Junkie! Newly employed? Well, congrats! Your week looks super yummy, enjoy! Congratulations on the new employment!